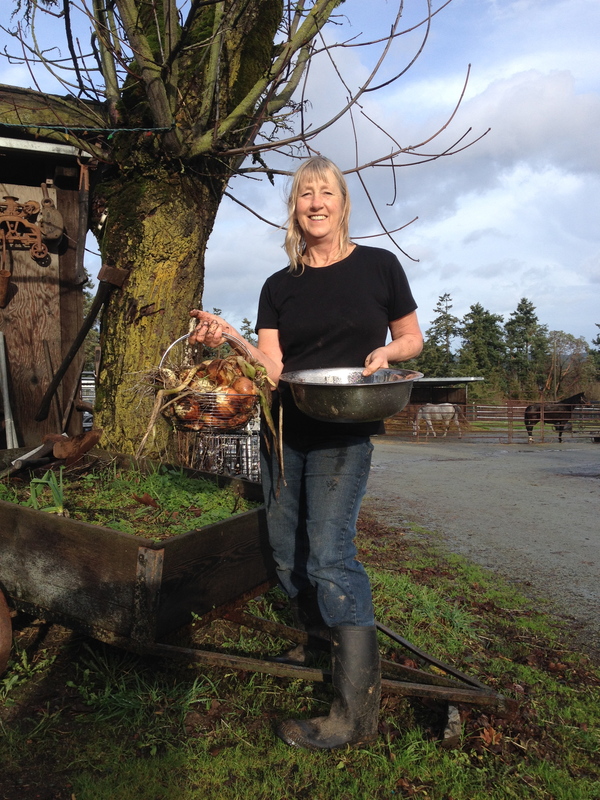 We are a 10 acre mixed farm on the beautiful Saanich Penninsula. We moved to this historic farm in 1984 and ever since have been working passionately to create as sustainable a place as we can. 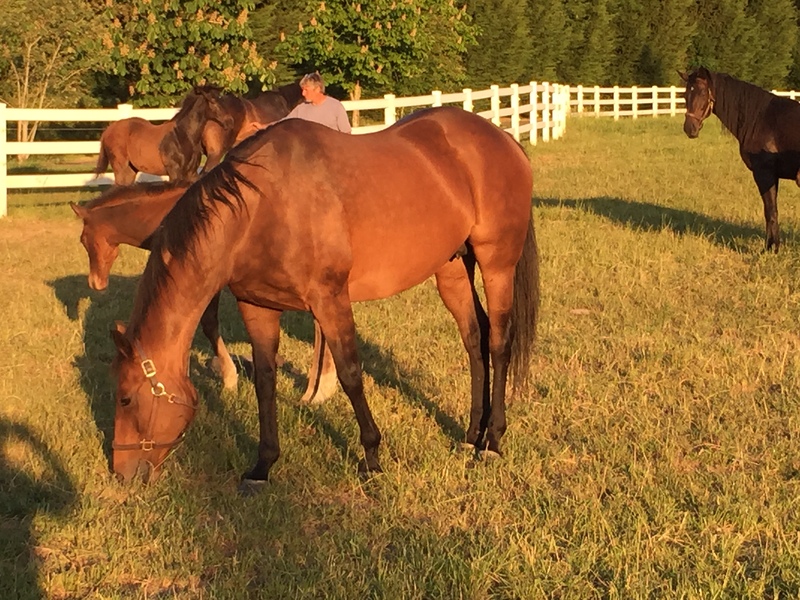 We operate a farm feed and supply store, breed thoroughbred racehorses, raise poultry and sometimes, animals for meat. Sustainable initiatives include rainwater harvesting, solar panels, food production, a composting toilet, and an integrated permaculture water management system and food forest. Our dogs, cats, and donkey roam the farm and keep us smiling on a daily basis. – Loading customers’ vehicles with grain/hay/fencing etc. – Enjoys a variety of work activities; each day is different then the last! – Supply of farm grown vegetables, fruits, eggs etc. Email Nicky at whitehousestables@telus.net a cover letter, resume and 3 references. Only candidates selected for interview will be contacted. We normally stay open on stat holidays but this is a special one. We will be Closed Saturday July 1st. Yesterday we had a solar array installed by Viridian Energy Co op which should have us carbon neutral on our farm, in the store and workshop. We had hesitated to move forward on this long planned project but finally took the plunge and feel really good about it. Another green initiative is the return of the new pro form feed sacks, which are a #5 recyclable. We have a tote for you to put them in and we will be recycling it when full. 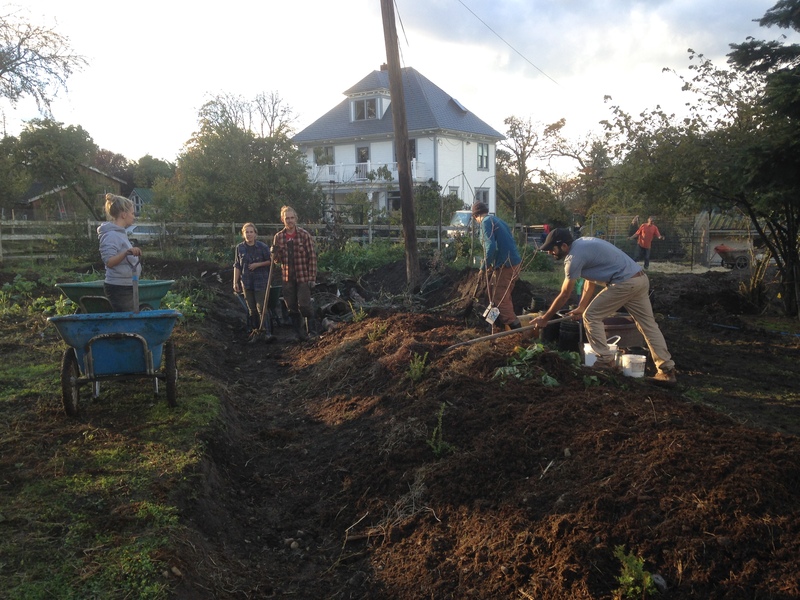 In the meantime Constance has been farming the land and it’s an oasis out there! 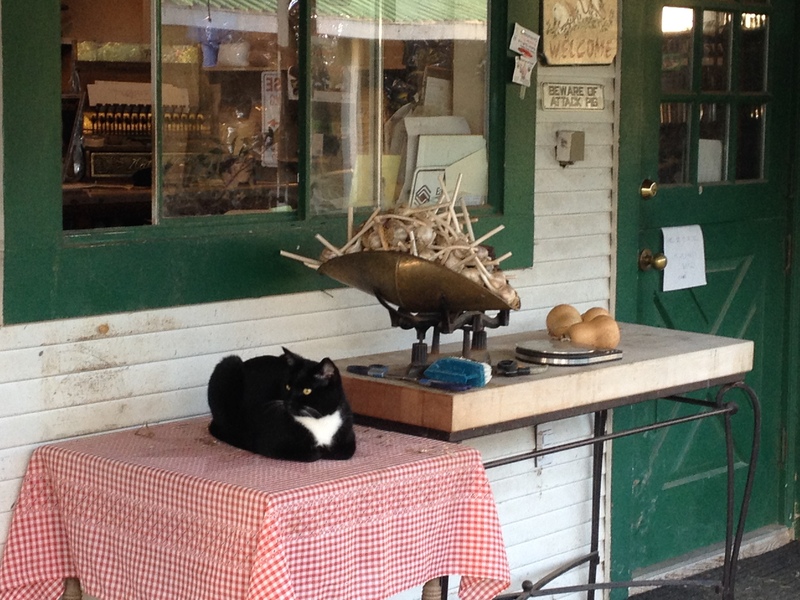 Great meat and veggies that you can buy with confidence, that she sells through the store and farm markets. e mail her at Ilovethisfarm@gmail.com. We are hosting Tahn Towns from Healthy Horses this Thursday June 23rd from 6.30pm – 8.30pm. Quick up date on the goings on around here. The horses keep us busy every day, playing “tetras” with them, making sure every one gets a chance to stretch their legs and roll in the mud. We have reached that critical “3 week” window on our first in foal mare, Valentine. The camera is up and we are keeping a sharp eye on her. The yearlings are developing wonderfully, becoming monsters some days, a good thing I think, as they really develop the bodies and minds of runners, just a bit hard on us!!!! Our sows were both bred this week by Angus so hopefully we’ll be seeing piglets in June. Patsy cow was delivered by us to her new home with the gents at the Fickle Fig. 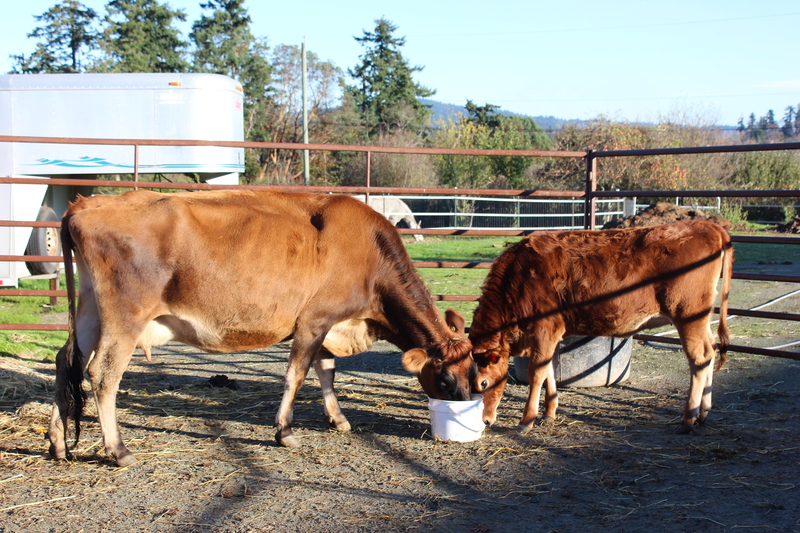 I’m sure they will produce some great food with her milk after she calves in the summer, we also returned her cousin, Ferdinand, to the crew at Ten Acres. We love having a truck and trailer that can do the jobs needed by small farmers. 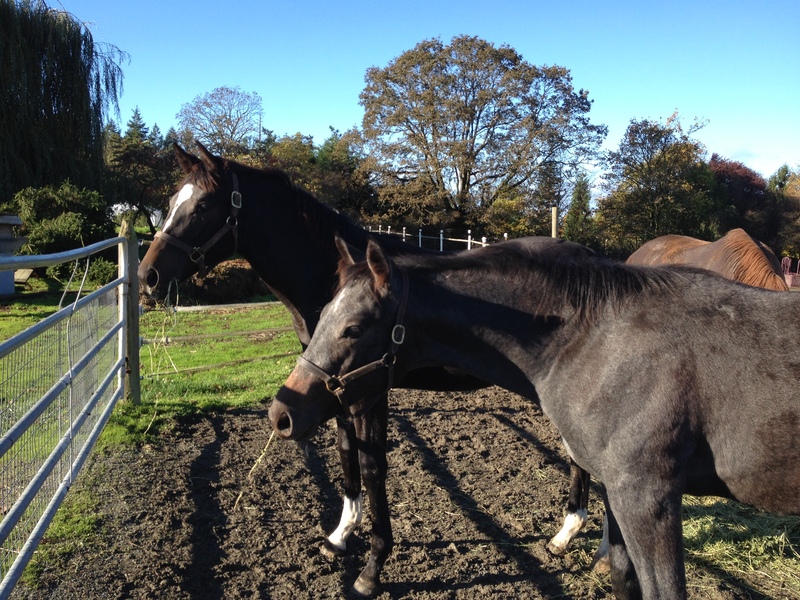 2 of the 3 mares in Vancouver have been bred and will return home this week. The chickens are starting to pick up egg production, and the orders for Aprils influx of young birds are flowing in. We are almost sold out on the layers, still meat birds left at this point though they are also going fast. attention due to the many deadlines I mustn’t miss! As I swelter still in this never ending summer, we are starting to put things together for the upcoming thoroughbred sale on September 9th at Thunderbird Showpark in Langley. The yearlings are brought into the barn every day to stop their coats getting sunburnt, they enjoy the routine, not having to compete for their grain ration and able to have at least one good snooze, I often catch them asleep flat out. The vet has been and run Coggins tests, updated vaccinations and confirmed the gelding status of our lone boy. We tidied them up and took pictures of them to advertise them on the notice boards at the track and for my online followers, they are posted on facebook https://www.facebook.com/WhieHouseStablesFarm as well as on the thoroughbred page on the web site. I had 2 wonderful days at the races with my sister visiting from England, something very special to share especially on the day Stan raced and won his first lifetime start in a stake race! 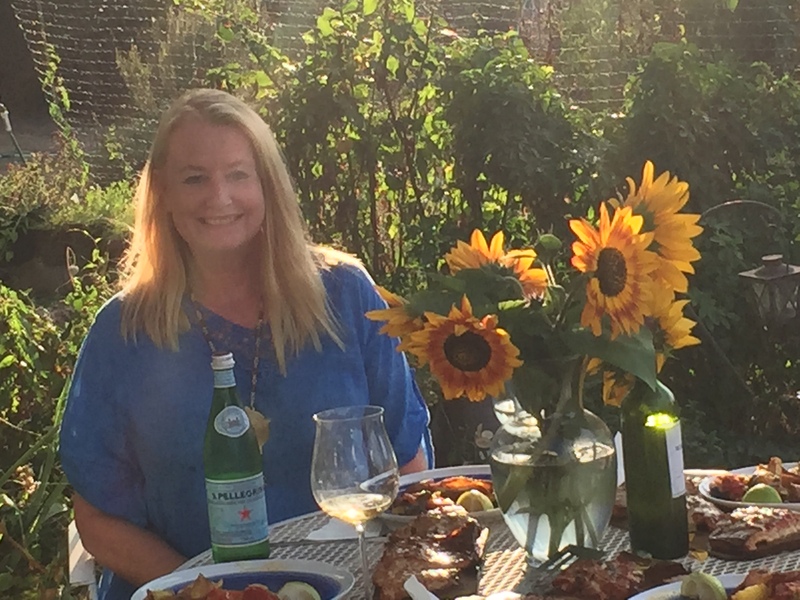 We spent the month eating fabulous homegrown meals, she was amazed at the seeming never ending supply of food we produce. 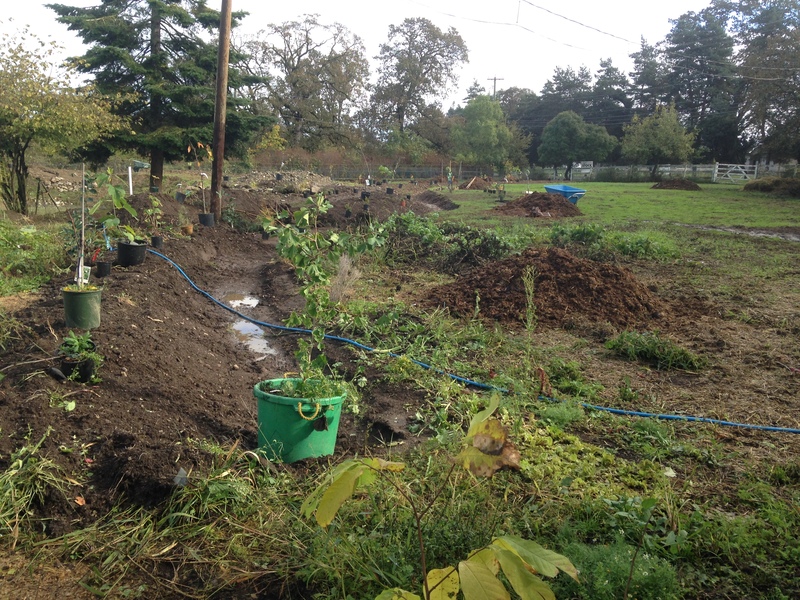 The front field is currently very productive with all Heathers vegetables she has growing for her CSAs and the N Saanich farm market as well as our ducks and chickens foraging the pasture areas before they get harvested next month along with the turkeys. 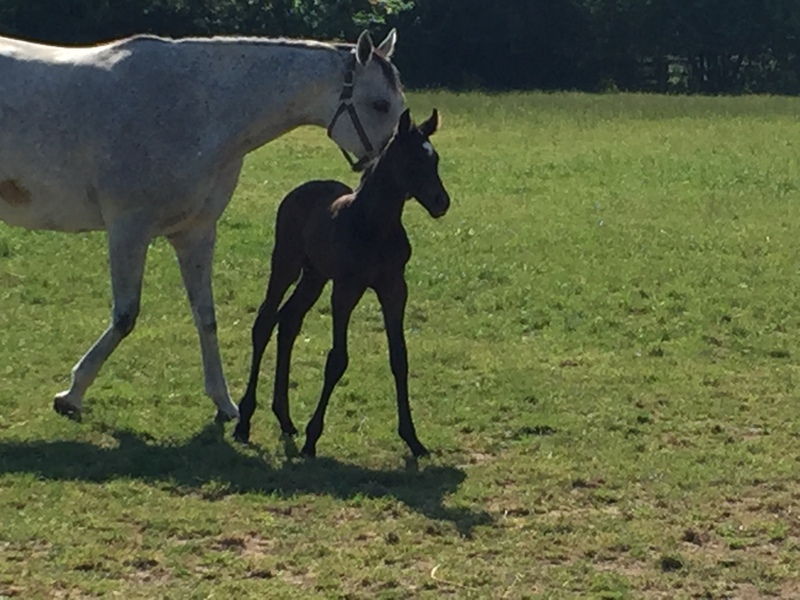 What a whirl wind this spring has been, we have just got to the end of our foaling season with 5 gorgeous babies, 3 colts & 2 fillies safely on the ground. 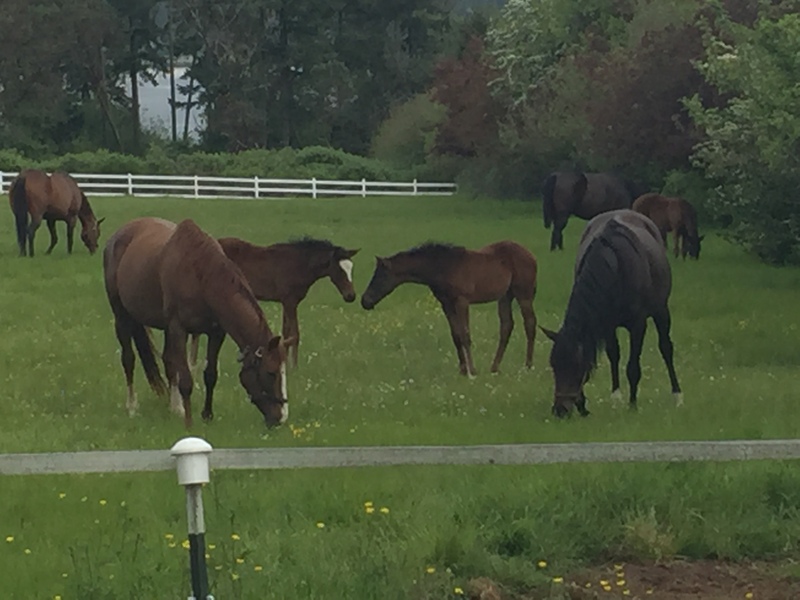 Last years babies, now stunning yearlings are entered in this falls CTHSBC sale at Thunderbird in September. The farm animal numbers never seem to decrease, even though we vow to reduce our workload. 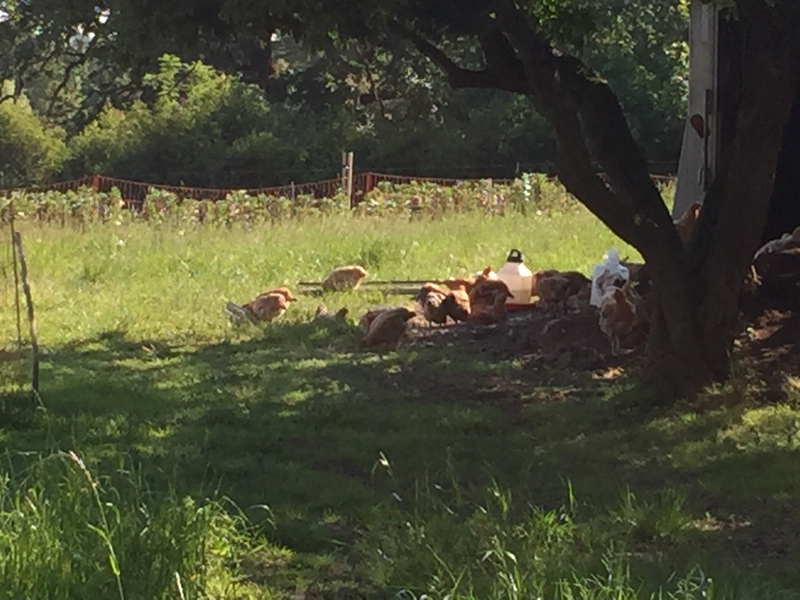 We are really enjoying flocks of ducks and geese, something new for us to try, feeling they are a more sustainable form of meat production and will save on the weedeating and mowing in areas the cows, horses and donkey can’t get to. The results have been encouraging so far, though we spend time fencing instead of weed eating. Actually we rarely use a weed eater, Norman is a master with the scythe, so last night our “Friday night date” was on Pats driveway, him scything , me pointing out all the plants buried in the grass and weeds, so they didn’t get sliced! The cows, Bella and Patsy, following us and swallowing everything that came their way. Angus, our wonderful Gloucester Old Spot boar, is digging an area in the “Nile Valley garden” ready for planting some heat loving plants. He took his time to reach maturity and breeding age [we should have realised that would happen, the old breeds belong to a time when Flavour and Temperament were important, not like todays model of industrial production of fast growth not flavour.] 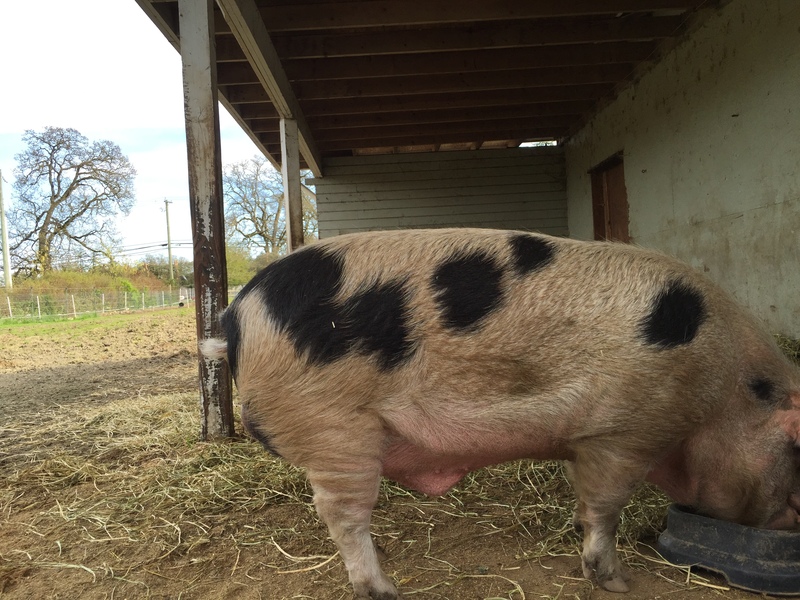 He has been out in the community meeting some lovely sows and producing some great cross breds. We now need to find some lovely pure bred GOS sows that are unrelated, to keep this great rare breed going in Canada. Liverpool University in the UK have a breeding herd of GOSs and there are some in the USA, but moving pigs over borders is an expensive and difficult thing to do. The plantings of the fall are doing great, we added lots more food trees, plants and bushes over the winter, so it’s an exciting time seeing what thrives and how much water retention we get with the swales and healthy soil. It’s been frighteningly dry here, so I’m hopeful that this will help us keep producing food into the future. 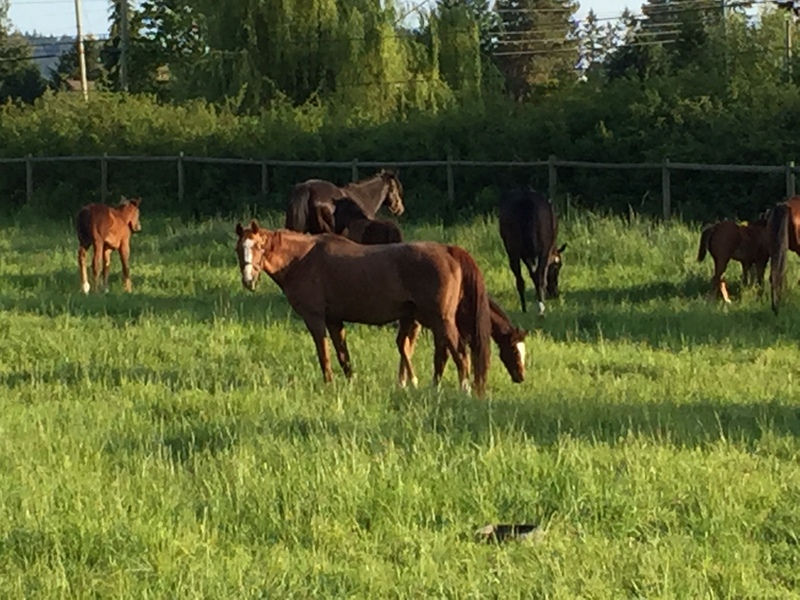 The dappled mares with their foals at foot and pregnant again!